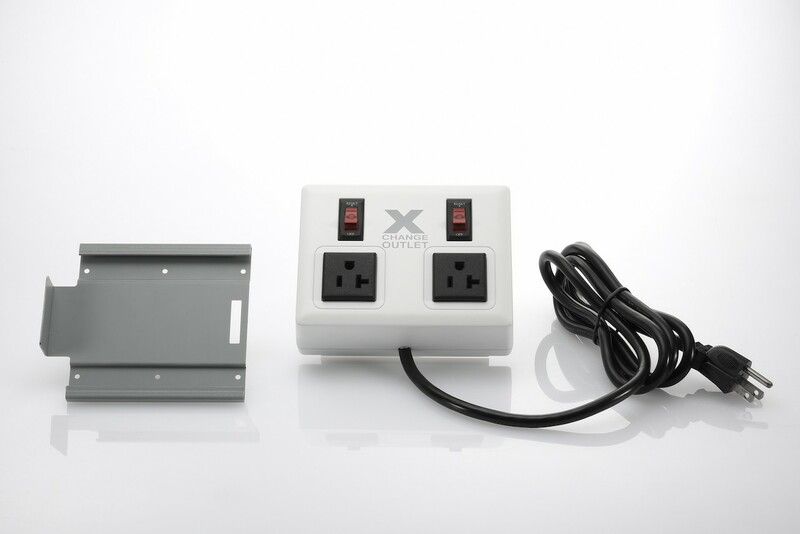 The X-10 is a wall-mounted converter that provides 10 Amps of regulated 120v~60 Hz output and is suitable for powering multiple appliances simultaneously using the included Xchange® Extension Outlet. Extension Outlet and Wall Mount. Input Power Cords, Type F, Type G, Type I, Type M.
The X-10 is the second most powerful Voltage and Frequency converter in the series. Providing 10 Amps of regenerated, clean, 120v~60 Hz power, it includes all of the same technical features of the larger capacity X-15. Perfect for powering multiple devices and appliances whose total load does not exceed 10 Amps. X-10 is a full-featured sine wave output regenerator that produces new, clean, and constant AC power; eliminating line noise and ensuring optimum performance. It is capable of providing 120v~60 Hz electricity for running household appliances such as refrigerators, gas stoves, washers, gas dryers, microwaves, household power tools, and small appliances. When location and space is an issue, the detachable legs, included wall mounting kit and Xchange® Extension Outlet allow this unit to be placed virtually anywhere – up to 6ft away from the appliance it’s meant to power! The X-10 is available in 2 colors. With sophisticated electronics, including power factor correction, as well as input and output EMI and RFI filters, it produces continuous power at over 92% efficiency and with output Harmonic distortion below 3%. High levels of regulation ensure 120v~60 Hz output with fluctuations below ± 2%, making it the ideal conversion device for taking high-end audio and home theater equipment overseas. 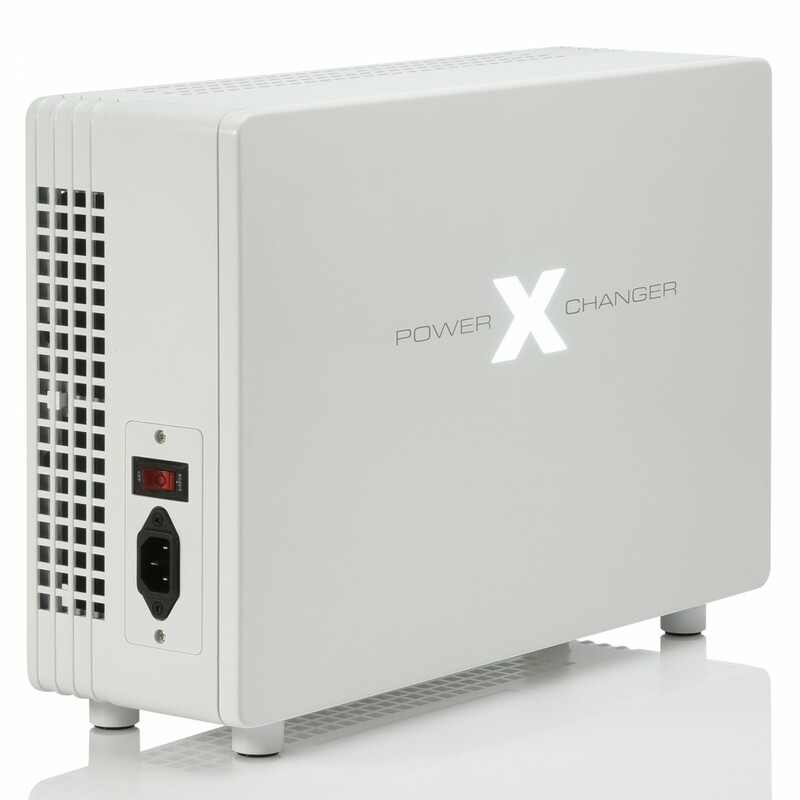 To the audiophile, the X-10 functions as a Regenerator with Power Factor Correction (PFC). It is a premiere choice for powering audio equipment to satisfy the most demanding audiophiles. With its clean sinewave output (typically < 1%THD) and with virtually no change in amplitude due to input voltage fluctuations and output load transients, audio equipment will always function with optimal performance. Because the output of the X-10 regulates so well, another advantage to the audiophile is that other equipment powered by the X-10, such as HDTVs and DVRs, will not introduce noise or distortion to the audio output via the common power connection. Additionally excellent EMI filtering on the input and output of the X-10 prevents RFI noise from being injected into the audio output. Another important feature for audiophiles is the high output surge current capacity (150 Amps) of the X-10. This capability to source high surge currents with minimal distortion of the output voltage results with crisp high volume audio transients. Frequently overlooked is the importance of PFC for noise free operation of audio equipment. Because PFC eliminates voltage and current distortions on the input power leads to the X-10, this potential source of audio noise is virtually non-existent. The X-10 has sealed, solid-state electronics that protect against humidity and dust, ensuring reliability and a long product life. An External Fan automatically cools the sealed electronics whenever the load exceeds 10 Amps or when environmental factors exceed operating temperature. Not only will electrical equipment perform better, but the X-10 also acts as an advanced voltage regulator, which fully protects equipment against voltage irregularities, such as under INPUT voltage as low as 180Vac and over voltage as high as 265Vac and provides an appliance with inrush surge protection of up to 150 Amps. Audible alarms notify overload, short circuit and temperature while in addition; an external LED provides visual notification of overload and temperature status. The X-10 not only meets the stringent standards of the UL and FCC in the USA, but also meets International Safety Standards.